When the Irish Foodies decided upon a Winter Warmer theme for the November cookalong I was delighted – one of my favourite things about winter is the comfort food that warms the cockles on cold dark days. It was quite hard for me to pick just one recipe and I must have changed my mind at least ten times but in the end I decided upon a rich, deep, savoury Beef & Guinness Pie, served up with some creamy mash. The great thing about this recipe is that with the addition of extra liquid it can be served as a rich hearty stew. Pat the meat with kitchen paper to dry it (this helps it to brown rather than sweat when searing) and season lightly with salt and pepper. Heat a tablespoon of oil in a large heavy casserole/pot on a high heat and when almost smoking hot add in half of the beef spreading it out in one layer so that all pieces are in contact with the bottom of the pan. Allow to sear for a minute or two and then turn over and brown the other side. The idea here is to give the meat good colour quickly and this can only be done if the pot is hot and not crowded with meat. When you have browned both sides of the meat remove it with a slotted spoon to a plate and then do the same with the other half of the beef. Turn down the heat in the pot, which should by now have a dark meaty residue on the bottom which will add lots of flavour. Add in a further tablespoon of olive oil and then the onions, celery and carrots and stir to coat in the oil. Cover with the lid and allow to ‘sweat’ for around 10 minutes, stirring occasionally, until the onions and celery have softened. Now add back in the meat and any juice to the pot, sprinkle with the flour and stir to coat evenly. Allow to cook for a couple of minutes then add in the tomato puree and thyme, stir again then turn up the heat and add in the Guinness and beef stock, bring to the boil and allow to bubble away for around 5 minutes. Turn the heat to very low and leave to cook away for uncovered for one and a half to two hours, until the meat is tender then check the seasoning and add more salt and pepper if required. Leaving the lid off will ensure the liquid reduces and thickens to give a good consitency for pie filling. 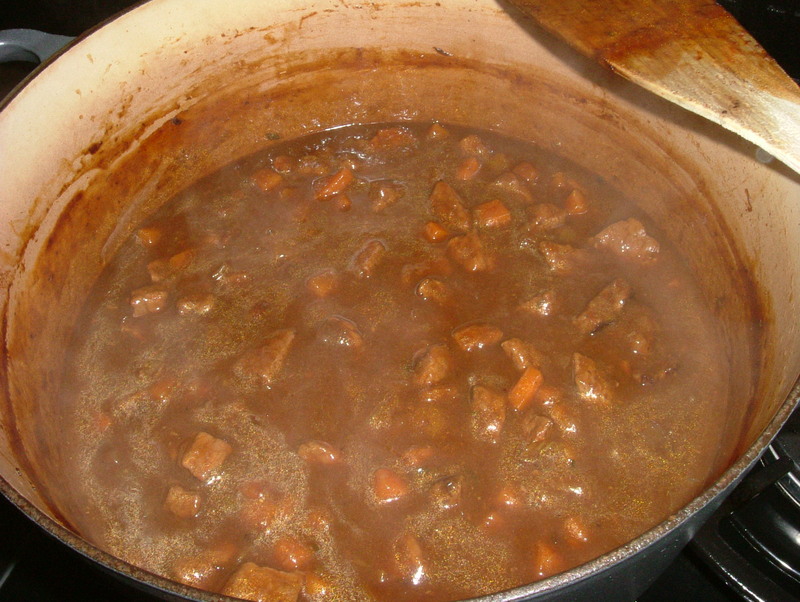 If you are making this recipe to eat as a stew then add in an extra 600ml of beef stock and cover the pot with a lid once you turn the heat down to avoid evaporating off the liquid. Preheat the oven to 180ºC. Using ready roll puff pasty cut out a lid for your pie dish ensuring that you cut on the generous side to allow for shrinkage. Butter the rim of the pie dish and fill with the beef and Guinness filling. Place the pastry lid on top, tucking in around the edges and brush with the eggwash. Place on a baking tray and cook in the oven for around 25/30 minutes until the pastry is cooked through and golden. Looks delicious. Yet another yummy recipe to add to my to-do list! Thank you 🙂 Oh man I know what you mean about the to-do-list – mine just won’t stop growing! Have been dying to try this since you tweeted about it, would be perfect with the super winter-y weather this week. Might see if I can get the few bits and pieces while I’m out and about tomorrow and do it tomorrow night. How many would these quantities serve? 4? 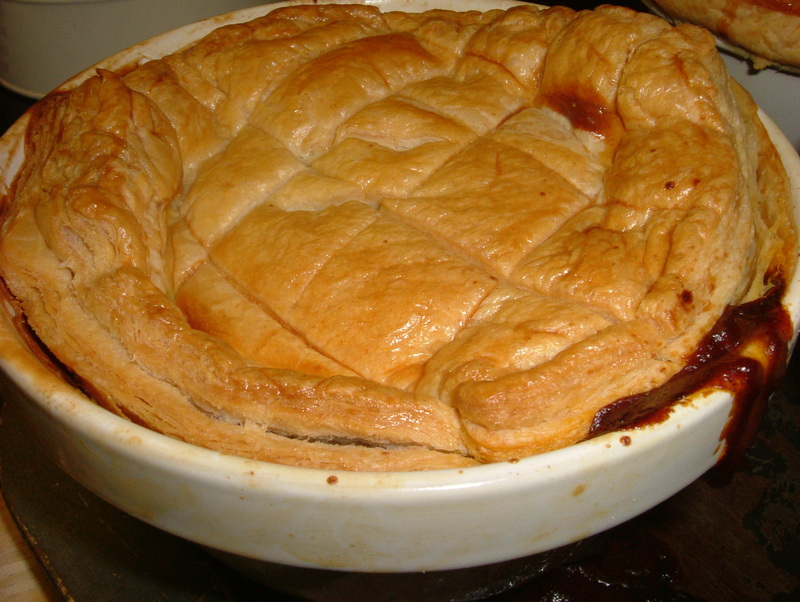 ..mouthwatering gravy oozing out at the edges, just how a pie should be..
Heehee 🙂 it is a bit of a messy picture though but yes, I do like a bit of ooze from my pies! Your pie looks fab.I was searching for such a recipe. What a perfect dinner on one of these freezing cold days!! Hi there… thanks for the comment! Just the looks on that image is enough to make me hungry already! Going to Dublin in Feb, definitely doing this when I get back with some guinness! Hi there! Well you can’t beat the combo of beef and Guinness – it is just so right 🙂 Hope you have a fab trip to Dublin!